What will take place when the weight of the Core exceeds the weight of the Earth? A Holy Event. The true origin of the Moon is known and has been suppressed. What is life, and from where does life come? Where, within us, is our life? Should man look to space to find the source of Life? Or to the ground, and to soil, water and air? Life is taken from the fertile Earth and is contained within blood. What of water? Does water have life? Water sustains life, and that which sustains life, cannot be without life. Life cannot be sustained by that which is lifeless. Man, no less than other creatures is formed out of the ground, and the life of all creatures is sustained by water, air, and “every green herb” which sprouts from the ground. A teaspoon of soil is teeming with life, and there can be over five tons of microorganisms per hectare of soil. Man and all things of Earth were created by God out of the substance of this Earth. Bury a seed in the ground and it grows into a sturdy young plant: life cannot spring from lifelessness. The Core (Corazon, Coeur, Kore [as in daughter of Demeter the earth mother, and as in Koran]) of the earth is a solid mass of iron comparable to the size of the Moon. The core is surrounded by immense waves of sloshing magma (molten rock) the depth of these waves of magma exceeds the greatest known depth on earth which is located in the Mindanao Trench in the western Pacific Ocean which the British ship Cook (1962) found to be 11, 516 meters in depth exceeding Mount Everest’s height by 2, 660 meters. The magma surrounding the core was incorrectly named ‘the core” before science became aware of the solid ball contained within the magma. Rather than renaming the magma, or just referring to it as the ‘surrounding magma’ they named the actual, solid core ‘the inner core’ and left the name ‘core’ for the thick, molten, metal and rock that swishes around the core. When I refer to the ‘core’ I always refer to the solid core. 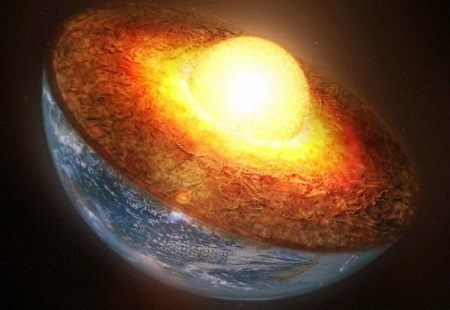 The core spins faster than the magma, I quote: A study in 1996 showed that over the previous century, the extra speed caused the core to gain a quarter-turn on the planet as a whole. So the core makes a complete revolution with respect to the rest of Earth in about 400 years. Immense pressure keeps it solid. The following knowledge is known and has been suppressed, awaiting ‘discovery’ by one or other scientist who will doubtless receive the Nobel award for the discovery. The discovery will be accompanied by great concern for mankind and will be the first point in a series of events to frighten mankind out of his wits in the hope that he will be willing to evacuate the earth. The earth, as everyone knows, rotates in the counter-clockwise direction, the Truth is that the core rotates in the clockwise direction, that is to say, the core and the earth are two separate bodies having opposite rotation. Once you know this fact it becomes clear that the great waves of liquid rock inside the earth, surrounding the core, are created by friction. The body of the earth and the body of the core rotating in opposite directions cause friction and the friction causes heat, the heat melts the metal and rocks at their interface. Friction is a force that appears whenever two things rub against each other. Whichever direction something moves in, friction pulls it the other way. Move something left, friction pulls it right; move something up, friction pulls down. Nature has given us friction to provide us with heat and energy, and to discourage us from moving her stuff around. It’s worth remembering that although two objects might look smooth to the naked eye, microscopically, they’re rough and jagged. Perfectly naturally, within the body of the Earth, light objects float upward towards the surface and heavy objects sink downward towards the Core: differentiation. Heavy objects are constantly sinking down and adding their weight to that of the Core, thus it is natural and unavoidable that the Core grows in size and weight, and indeed the Core is constantly growing in the “belly” of the Earth. The growth of the Core within the Earth is reflected in the growth of all things on Earth. Without the growth of the Core, there would be no growth whatsoever. As mentioned above, the Core rotates in the clockwise direction and the Earth-major rotates in the counter-clockwise direction. The friction produces heat energy. The Earth is brimful of energy. The heat energy is released…thrusts upwards and causes seeds in the ground to grow. It is from these actions that the Hindu’s have concept of the Shiva Lingam. The energy that emits from the Earth and enters all things on the surface of the Earth and is called “life”, “growth”, “gravity” is also called “time”. And this is the beauty of words: they are trying to communicate. The letters in the word “time” also spell the word “emit” and this is so because “time” “emits” from the “Core” of the “Heart” of the “Earth”. Life is the energy growing inside us. Life originates within the pregnant (gravid) Earth and “emits” from the Earth (heart) in the form of “time” and has been known to us as “gravity”. The word Core (Coeur, Kore, etc.) means Heart in all languages and it is noteworthy that the letters in the word Earth also spell “Heart”. “Life” and “growth” are the energy that is emitted from the Core of the Earth, this same life and growth, which emits from the Core to sustain you and all other organisms on Earth, is called gravity. The word “gravity” coming from the word “gravid” means “pregnant”. So the word “gravity” should not be a mystery to you simply means that the Earth is pregnant. As the Core increases in size and weight, it slows down the rotational speed of the Earth. As a simple example, if your children were on a rotating carousel, spinning in the counter-clockwise direction, and you decided to slow the carousel down, without giving the matter any thought, you would apply your weight in the clockwise direction, the opposite direction of the carousel’s rotation and the carousel would slow down, if your continued, the motion of the carousel would stop. In the same way the Core’s weight is applied in the opposite direction of the rotating planet, and the increasing weight of the Core gradually slows the rotation of the Earth. What will take place when the weight of the Core exceeds the weight of the Earth? A Holy Event. The Event involves the Birth of the Aeon (inner Core) through the Earth’s Yoni in the Weddell Sea and the next step of progressive evolution. The true origin of the moon is known and has been suppressed. In simple terms God is the source of that life which is growing inside us. Where then is the source of all life on Earth? We must not look for the source of all life that is growing on Earth anywhere other than right here on Earth. If something is growing on Earth its life source cannot be located in outer space. If a tree is growing in your garden the source of its life must be located somewhere near to your garden, the source of the life of the tree in your garden cannot be located somewhere in your neighbors garden. The source of your life cannot be located somewhere in another city. The source of any living organism on planet Earth must be located somewhere close to that specific organism and since there are countless different living organisms on Earth all having their life sustained by one source which we call “God” we can assume that God is everywhere. And yet we must not get away from the fact that the source of the life of a specific tree growing in France cannot be located in America. Just as your life-force is not unfolding on a different continent. Life comes from one source but divides and enters any organism wherein it can find expression. We can also conclude that the source must be somewhere very close at hand. Close at hand, yet far away in a tree in France and yet in a tree in your garden…where? The source of all life on Earth is located in the heart of the Earth, That which we, so rightly call “Core”. Is life therefore God? God is the source of the energy growing inside us, the energy we call life, time, and gravity. The life within our body is God finding expression within us, but it is not God as such. God as such is two-fold: the Earth mother and her sacred heart, the Core. As the Earth mother her identity is feminine. As the Core his identity is masculine. Man is much closer to soil than he is aware. 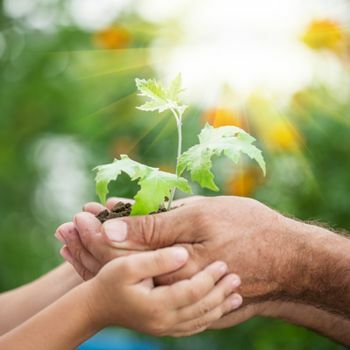 When you bond with the Earth, and become fully aware of your close relationship with the soil, developing that relationship to a “mother and infant” intimacy, soil will open up the wonders of its healing powers to you. These healing powers are not limited to the immediate healing properties present in the soil, but extend into the real of miracles. For the man who truly unites with God through his Mother Earth, the Earth will do wondrous things. The apostles can work miracles, through worship of God, love of this Earth, and faith. Faith! Not the faith of the common man who questions even that which is clear! The unquestioning faith of the saints! What separates the saints from common man is not their worship, which common man can also do, and it is not their acts, which common man can also do, it is their unquestioning faith in God.